I hate bottled water with a passion. While our country has the cleanest tap water in the developed world we pay billions of bucks a year for an environmentally-damaging package of plastic, trucked all over the place, instead of walking to a sink. 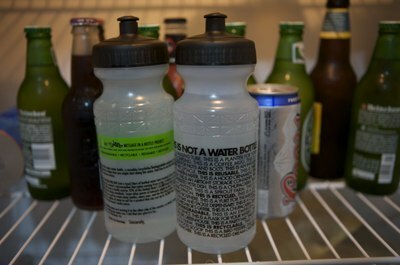 Without a doubt, drinking bottled water is one of the worst things you probably do daily. Swobo hates bottled water too, and they’ve decided to combat the ubiquitous trend with a series of recycled bottles that have messages on them. The most interesting (though possibly not terribly effective) bottle in this Message in a Bottle program has printed on the side a letter to Nestle (who makes more bottled water than anyone in the US) explaining why they shold stop the practice of producing bottled water. The flipside of the bottle has a printed address to Nestle, simply slap a stamp on there and it’s good to go. I don’t think that a few bottles to a corporate giant will end their wasteful practices any more than I think that writing a letter to Big Oil will cause them to want to forget about drilling in Alaska, but I do think that the bottles can cause the people who read them to think about their behavior and possibly change their habits. The one part of the project that bothers me is the last line on the Nestle bottle that warns the company to “stay out of McCloud, Ca.” which is the site of a watershed under consideration for use by Nestle. I’m a bit uncomfortable with mailing anything that tells someone to “stay out of” some place, as that sounds like a bit of a threat to me. I applaud Swobo for thinking this up, but as many commenters have posted on their forums have mentioned, it might have been a better idea to have put a post card in with every bottle so that people could mail the post card now and use the bottle for as long as possible. It doesn’t really help the cause if one waits the average few years life of a water bottle to mail in the container when action could happen now instead. The other bottle we have in the campaign is a tad more benign but more helpful I think. It lists all the things you can do with a “dead” water bottle, such as plant in it, rescue gerbils and so on and it’s made me rethink my end-of-life policies towards bottles.